Piano Pavilion - acoustic and digital pianos for sale in Essex. Hello and welcome to the website of the Piano Pavilion. 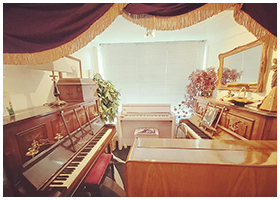 The piano showroom is one of the largest in Essex, specialising in pre-owned acoustic pianos including uprights, grands and baby grands and PianoDisc installations. Whatever your decor, musical needs and budget a selection of good acoustic starter instruments are stocked here from £500 upwards. For viewing by appointment: email sales@pianopavilion.com or call 01702 474771 or 07481 702702 . Just fancy a play? Come and play our pianos for free! As part of our open door policy you may come and play any and all of our instrument all day, any day free of charge. Bring your own music if you like. All welcome. 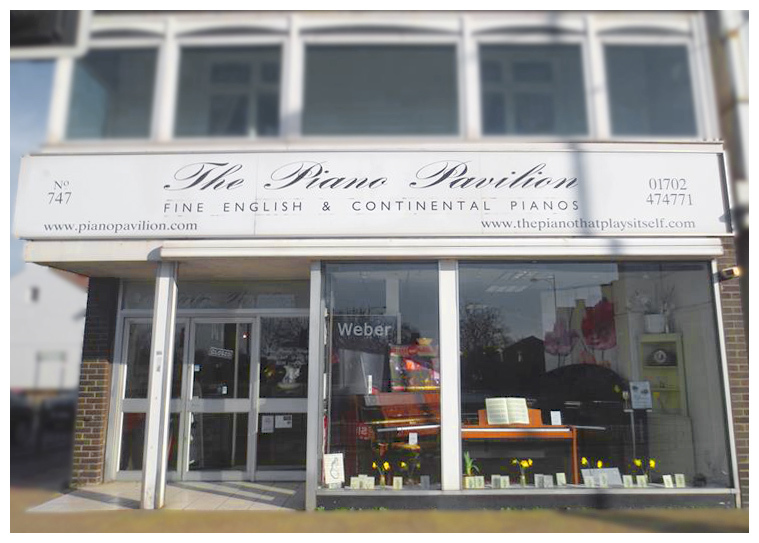 The Piano Pavilion was established in Westcliff-on-Sea in 1998 and is privately owned. We do not employ sales staff - you will only find technicians and tuners here who will be more than happy to discuss your requirements, offer advice and demonstrate the pianos. We have supplied pianos for many well-known musicians including Sir John Dankworth and Dame Cleo Laine, John Lill, Malcolm Binns and Buddy Greco, numerous show-business celebrities including Lee Mead (winner of the 'Joseph' competition), Members of Parliament, England squad footballers, and events including 'The Rat Pack' Concert in the Park, Southend and Leigh Music Festivals, Southend Film Festival, Village Green, The British Jazz Foundation, music videos shoots, Channel 4 productions etc. All pianos are professionally prepared to the highest standards irrespective of the selling price to ensure that every piano purchased performs to its maximum capability. We believe in only offering quality instruments at fair prices with exceptional service and our guarantee ensures you will always be satisfied with the piano you buy from us. All used pianos have a written guarantee (unless otherwise stated on the showroom ticket), in some cases including a guaranteed buy-back, and prices include delivery within a 30 mile radius and complementary tuning. New pianos typically have a 5 year manufacturer's warranty although some have a 10 year warranty. We supply pianos all over the world and would be delighted to offer a quotation for supplying a piano wherever you live. OPEN DOOR POLICY : All pianists whether beginner, amateur or professional are welcome to come and play ANY of our pianos ANY day during normal opening hours. There is no charge, no time limit and no hard sell. We actively encourage musicians to explore the different tonalities and playing qualities of our instruments both historic and modern. Bring your own music or we can lend you some if you arrive without. MUSIC : We supply printed sheet music for all instruments. A free ordering service is available and music usually takes only a day or so to arrive. We supply print-on-demand music from archives around the world. Additionally we stock a frequently changing selection of vintage and antiquarian scores. TUNING & REPAIRS : We have the resources of highly qualified and experienced piano tuners and craftsmen technicians. We are fortunate to have the services of an excellent piano tuner who worked for Steinway & Sons for over 20 years and has tuned pianos in all the major concert halls, studios and venues in and around London for some of the world's greatest performers.